I grew up in a home where one of my parents was depressed. And I will go into my personal analytics another day. For the purposes of this book recommendation, I will disclose that in the twelve years since moving out on my own, I have done A LOT of work on myself to get past the circumstances of my childhood. That does not only include having a depressed parent. Much work was done in the first seven years, prior to having my first child. I thought I was cured. But alas, not exactly. I had yet to be truly tested. I picked up Children of the Depressed by Shoshana S. Bennett because I am basically going crazy trying to figure out why I can’t handle my kids— i.e. I get angry, I isolate myself etc. (One thing I do have under control is, I do not name call or make fun of them. It seems simple, but for me it was a very conscious decision when I became an adult not to use those weapons in combat). What I discovered in this book, is a cohesive collection of all the work I have already done. Those who are angry, ashamed or depressed themselves are the starting points to healing outlined in this book. Though this is not me, starting at the beginning is the right place to start—as if you were just emerging from this family situation, or if you have not realized the reasons behind your attitudes/ behaviours to this point in life. I did not agree with everything the author had to say, but she is amenable to that idea and says so in her book. The best way to use a compilation of experience such as this, is to seriously consider what will work for you, and do everything you can to get what you need to get out of it. If you don’t feel confident in your subjectivity, read it with a friend, or spouse. But then commit to listening to what they have to say. I did glean a few gems for my own growth, such as the most likely reason why I feel a bit socially awkward, and confirmation that the skills that I possess because of my childhood are the same skills that make my life abundantly better today. I also got a kernel of wisdom to work diligently on, the exact reason I picked up this book in the first place: a reminder that I am too focused on my own needs. I know this is why my kids grate on my nerves— I am trying to do my own thing, get things done; while I should be just hanging out with them, playing with them. 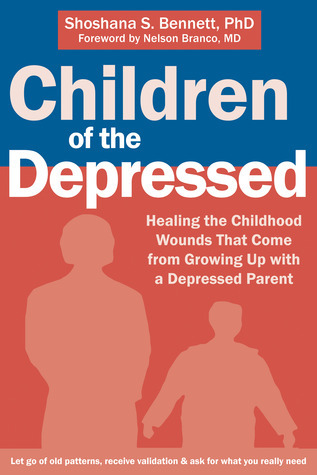 Anyone who feels like a depressed parent may have been in the picture as they grew up (sometimes you don’t realize it until you really sit down to think, other times it is obvious), should consider reading this book. It will be most enlightening to those near the beginning of their healing journey, or those who feel like they have not gotten any traction on the work they have done to change and heal. However, as in my case, even though I have worked at it, studied, been counselled and mentored and prayed for, prayed myself, journalled and talked with my parents etc etc etc already, I still managed to pull valuable fragments from these pages to begin implementing a strategy for the biggest most meaningful piece of my own personal unmastered puzzle: treating my children right. And I would be willing to bet that if you are open to being honest with yourself, you will find some very important reminders for your own life journey too. I received this book from Net Galley for review purposes. This entry was posted in Muse Reviews and tagged book recommendations, Boundaries, Depression, Healing, muse reviews, Parenting, Relationships, self help. Bookmark the permalink. ← What are the best YA books?